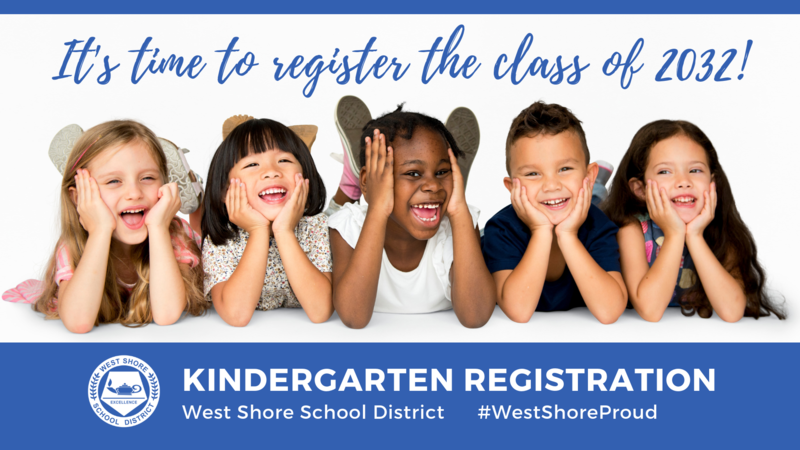 Kindergarten registration has begun in the West Shore School District for the 2019-2020 school year! Step by step directions on how to use PowerSchool Registration to enroll your student can be found below. To complete the kindergarten registration process, children must be at least five (5) years of age before October 1, 2019, possess an official birth certificate, and proper immunization records. This documentation can be directly uploaded into PowerSchool Registration. PDF scans or clear, easy to read photos will both be accepted. If you have specific questions regarding registration, need an accommodation to access this information, and/or need assistance in completing the enrollment process, please contact the District Registrar at 717-938-9577 for assistance. Welcome to the West Shore School District! West Shore is now using PowerSchool Registration, an easy to use, secure online registration system for new student registrations. A new student is defined as new to the West Shore School District and having never attended any West Shore school, or a previous West Shore student who is re-enrolling. Click the appropriate link below to access the online registrtation system. Please Note: Registration for students in grades 1-12 for next (2019-2020) school year will open on Wednesday, May 15, 2019. Create an account if you have not yet done so for online registration. Complete the online registration process, submitting all required information. If you do not have access to a computer or internet, we have computers available at the Administration Center where you can complete the registration process with assistance. Please contact the District Registrar at 717-938-9577 to reserve a time to do so. If you are unable to complete the registration process all at once, you may save your work and log back in to continue where you left off. If you have more than one child to register, you will be able to start a registration for the second, etc. child once you submit the information for the first student. All pertinent information you provided for the first student will automatically be entered for the other children. If you have any questions during the application process and need help, save your work and log out. Contact the District Registrar at 717-938-9577 for assistance. After submission of your information, you may need to finalize your enrollment at the Registration Office. You will need to upload the following during your online registration. Materials may also be brought with you to your appointment. Please note, until these materials are received, the District cannot finalize a registration or enroll a student in the District. Proof of child’s age: Any of the following constitutes acceptable documentation: birth certificate, baptismal certificate; copy of record of baptism-notarized or certified and showing the date of birth; notarized statement from the parents or a relative indicating the date of birth; a valid passport; a prior school record indicating the date of birth. Immunizations required by law: Immunization record, a written statement from the former school district or from a medical office that the required immunizations have been administered, or verbal assurances from the former school district or medical office that the required immunizations have been completed, with records to follow. Proof of Residency: (2 required) Acceptable documentation is a current Pennsylvania State issued driver’s license or a Pennsylvania State ID card issued by PennDOT with your current address AND a copy of the deed, lease, settlement agreement or property tax bill. A military housing letter is also acceptable for those on active duty with the armed forces. Parents or guardians who reside with a friend or relative in the West Shore School District must have the resident accompany them to the appointment with a copy of their proof of residency and valid ID to complete Multiple Occupancy paperwork. Multiple Occupancy paperwork can be obtained at the Registration Office. Government Issued Photo Identification: This is used to verify the person’s identity completing the registration. IEP/Special Education documentation: If your child has an IEP or any special education requirements, please bring that documentation with you. Court Appointed Guardians: Court appointed guardians must provide the District with a copy of the court order giving them custody. If you have specific questions regarding registration, need an accommodation to access this information, and/or need assistance in completing the enrollment process, please contact the District Registrar. Please Note: All families moving within the District, from one school to another, must complete a transfer form at the District’s Registration Office. Transfers may be completed Monday through Friday by appointment. It will be necessary for parents to show proof of their new residence. From I-83 Exit 36, take Fishing Creek Road west (.1 mile) to the Administration Center on the right. Students registering for Kindergarten must turn 5 years old before October 1. Students registering for first grade must turn 6 years old before October 1. The Board may assign to first grade a kindergarten student whose chronological age is less than six (6) years, but not less than five (5) years of age. This assignment may be granted by the District after the start of the school year by assessing the student’s potential for success in first grade. These assessments may include formal achievement, ability and readiness testing, as well as curriculum-based assessments and observation in the school setting. In the case of students applying for admission to second grade, or any higher grade following attendance at a non-certified or approved school, the student shall be credited with all grades successfully completed when deciding placement. Information on obtaining certified copies of your child's birth certificate if you do not have one available. Section on Immunizations outlines requirements for school and lists locations where immunizations can be obtained.